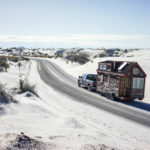 I’ve been traveling around in my tiny house for six months now. I’m very comfortable inside the small space, but that doesn’t mean there weren’t a few challenges along the way. Once or twice I’ve cried out in frustration, “it’s too small!” Other times I’ve been thankful for having less space to clean and maintain, and for the freedom it has provided. Bottom line: I’ve learned a lot from my tiny home, and I’d like to share the lessons with all of you. I know how much water I use on a daily basis – approximately 15 gallons when I take navy showers. I know how often I need to dump the urine container on my composting toilet – every 3 days. I know how much propane I use per month – about 15 pounds. I know these things because I have to physically empty my grey water tank, fill my fresh water tank, refill my propane tanks, dump my toilet, etc. I take navy showers and use the Nature’s Head to conserve water and propane. Measuring my consumption in physical labor has made me more conscious of my waste. There’s a HUGE difference between seeing decimals and graphs on your monthly bill and having to physically refill your tanks. I use less. I waste less. I save more money. I have nightmares about clutter. In a tiny traveling house, clutter can mean the difference between owning three mugs or four. I don’t shop often, but when I do I need to know: 1). What purpose will the new item serve? 2). Can it replace something else and/or increase the functionality of my daily life? 3). Where will it be stored? If I can’t answer those three questions, I DON’T NEED IT and I DON’T BUY IT! Similarly, when I want to get rid of something, I post it on Yerdle. I try to keep my kitchen counters empty. Everything tucks away and has a place. I’ve had the opportunity to tour many other tiny homes in the last six months. Sometimes I swoon over a great space saving idea or an innovative layout. I call it “tiny-envy.” I have to remind myself that my partner and I had zero construction experience before building our tiny abode. It’s not perfect, but my house is still pretty darn cool. And it’s mine! When we were building I was so meticulous about everything. If something wasn’t perfect, I wanted to redo it. Now the imperfections that once made me cringe don’t bother me at all. In fact, I kind of like them! Each scratch and hole was a lesson and a memory. 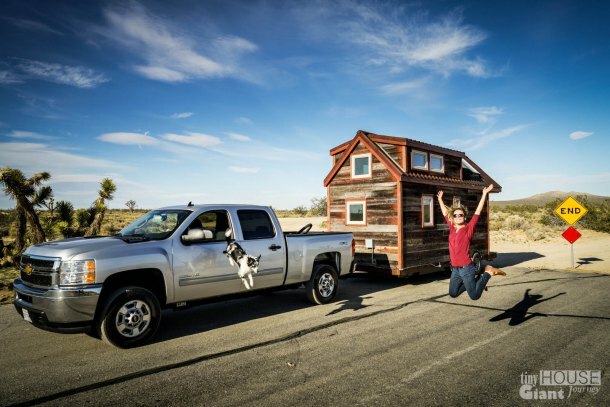 If you’re currently building your own tiny home, don’t beat yourself up. Enjoy the process, and recognize that imperfections can be beautiful. This is sound advice from my friend and fellow tiny houser – Art Cormier. Guillaume and I recently modified our staircase to have a few extra storage compartments. And now they’re full! Uh oh…the clutter monster is knocking at our door! We’re going to have to think twice before adding any new shelving or storage spaces in the future. If I don’t have a place to put new stuff, I don’t need new stuff! (See lesson #2). My kitchen cabinet. I own three mugs, two cups, two wine glasses and a bunch of spices. It’s full! Perhaps my partner would argue, but I’m going to make an assumption that I’m less needy now than I ever was before. I have less, but I want and need less as well. When I think about all the stuff I used to own and purchase, I feel overwhelmed. The tiny house has challenged me to unburden myself. I like the new care-free me! I clean less. I shop less. I cook more. I consume less. I primp less. I dress better. I eat better. I sleep more. I read more. I watch TV less. I drive less. I play with my dog more. I hike more. I go to the gym less. I travel WAY more. 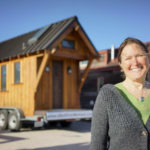 How would a tiny house change you? Anyone that knows anything about THOWs knows about you guys and all the work you’ve done to expose everyone as much as possible to this movement. Thank you. It is a pleasure watching your videos, seeing the ideas out there, and hearing your thoughts.